So now that we’re knee deep in Pippa milk from our goat share, I’ve been trying to figure out what to do with it all. The whole notion of cheese-making made me nervous–I don’t usually have the patience for things that require adherence to absolute precision over the course of many steps. Turns out, it doesn’t have to be that way! 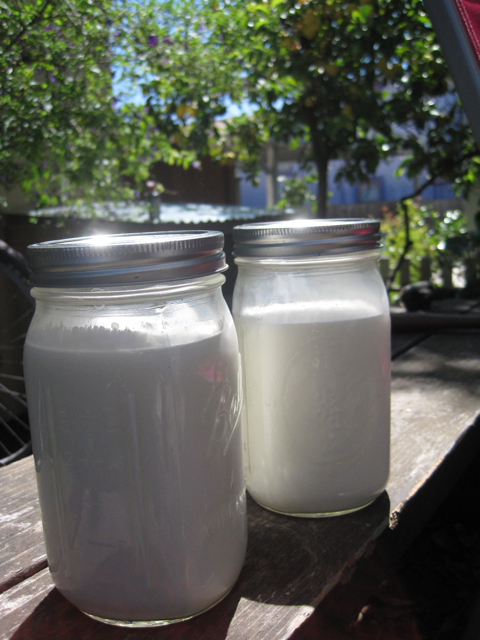 There are naturally occurring bacteria in raw milk that will do all the work for you. If you want to know more than you ever thought possible about bonnyclabber, you can read this. If you want to know what you really need to know, I’ll tell you. 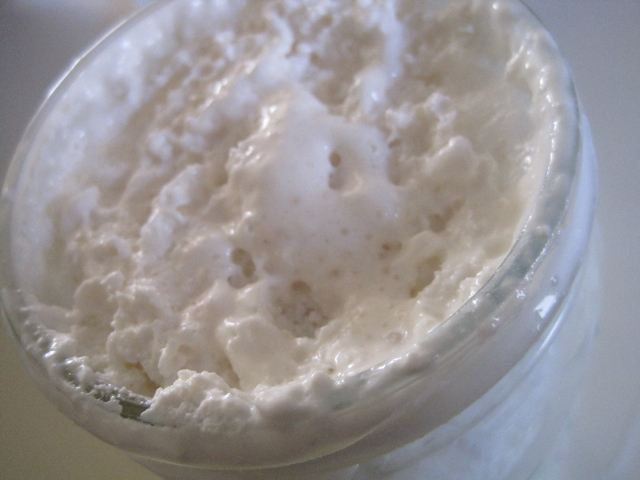 Bonnyclabber is essentially what happens if you take raw milk directly from the udder, pour it into an air tight container and let it sit for anywhere between one-and-a-half to three-ish days. Apparently, my dear grandmother used to talk to my mom about bonnyclabber. She would pour it over cornbread and eat it for breakfast. She also used to talk to me about the ways they would get around having no refrigeration in the Texas heat of her childhood. And now that I’ve been goat-milking for a couple of months, I get it. When you have an animal in milk, you get a lot of milk. Everyday. The milk piles up. And if you happen to live in 1920s midland Texas, you can’t just pop the extra milk in the freezer. What you can do is sit a jar of the stuff out on the counter and let it go all bonnyclabber on you. And then you have a creamy cheese that you can spoon onto things to make them more delicious, like cornbread. So here’s how I’ve been doing it. I start with a jar of goat-milk, still warm from Pippa’s generous udder. I usually get 2 quarts when I milk, so we drink one and make cheese out of the other. See how the milk has separated? And it did it all by itself! No rennet, no super heating, no starters. After we admire our impressive, spontaneous cheese through the glass jar, I pour it into a cloth-lined colander, and I put the colander over a bowl, to catch the whey. 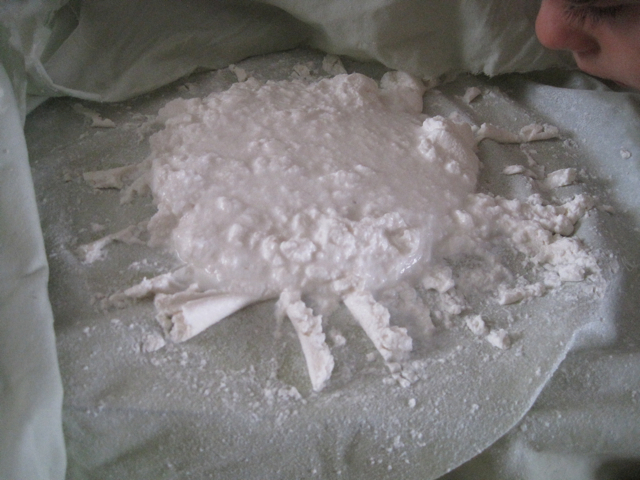 More about how fascinating whey is in a moment. Then I tie up the four corners of the cloth (in this case, I used a square of cloth that I cut from an old, clean pillowcase) and hang the little bundle on something, with the whey bowl underneath. And then I wait until it’s not dripping consistently anymore, usually 3-5ish hours. I got all eager beaver at one point and decided to help the draining along by squeezing the whey through the cloth. Turns out this is not a good idea–it gets cheese into the whey and then the whey goes kind a funky and it didn’t make the cheese drain much faster anyway. 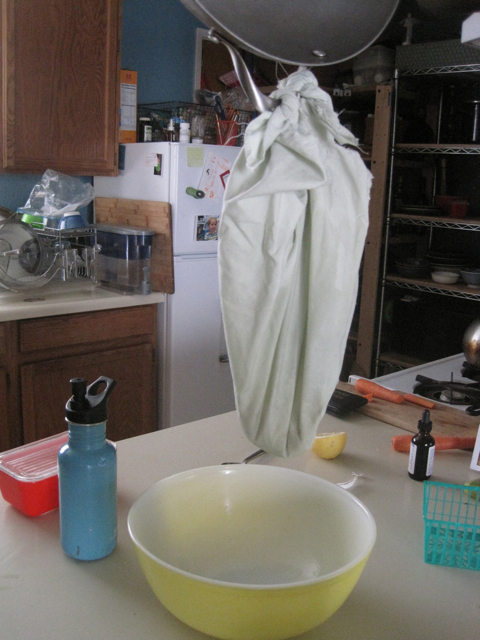 Once the dripping is done, untie the cloth and admire your cheese! J likes to greet the cheese with a good old sniff. And then I just scrape the cheese into one of my vintage pyrex containers with a spatula. It just seems like bonnyclabber woudn’t want sit around in some new-fangled tupperware. Oh, and the whey! You can pour all of the whey that drains off your cheese into a jar and keep it in your fridge. Whey is a great source of minerals, vitamins and probiotics, so it’s a great digestive aid. You can drink it straight–my friend R’s 2-year-old S can’t seem to get enough of the stuff. And you can also add a few tablespoons of the stuff when you soak and cook beans and grains. It helps to make them more easily digestible. I’ve been using a whey and water mixture to soak beans and rice before I cook them, and call me crazy, but I do feel less heavy and bloated after I eat them. So there you have it. The easiest cheese you ever made in your whole life. I’ve been using ours in place of sour cream, cream cheese or cream fraiche, or eating it with nuts and a swirly honey drizzle over the top. It’s dreamy. And a cheese I have the patience to make. I love this post! I’m gonna make me some bonnyclabber tomorrow! how did it go? are you all bonnyclabbered up? 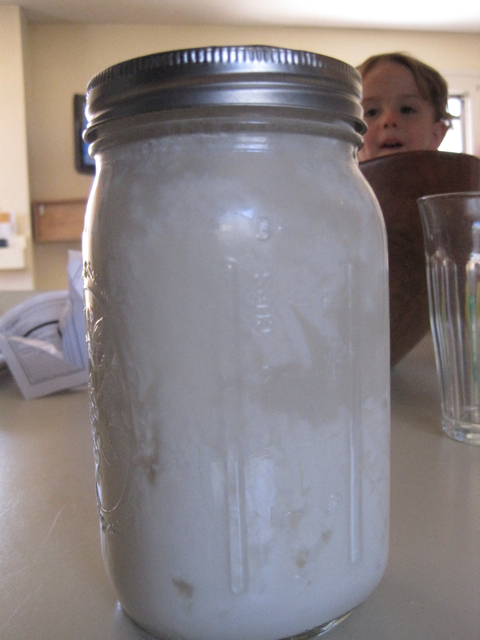 Stephanie, so glad you’re having fun with Pippa’s milk, you urban homesteader, you! So your fermented ginger carrots, or pickles? Whey? Amazing. Veeerrry cool. I’m going to try it. 🙂 Thanks for the good links, too. you are most welcome, radical goat lady. Amazing…it’s so hard sometimes to “get over” leaving milk out, even though there’s only been a few generations of refrigeration being normal. I can’t wait to try this! exactly!! let me know how it goes!